BTW, rear spoiler ordered from car id, paint shop located, drill at the ready thanks again for those pics. Diabolus, you have an XT with no upgrades! What the hell are you thinking. Slap a grill, Magnaflows, and some wheels on that ride pronto. I'm so jelous, I wish I had the XT. hehehe...I actually just have a X Premium. Just like yours except I still have roof rails. I actually modded mine the second day I had the car. I threw on a sports grill and front lip. my next plan is to sound deaden the doors and hatch, then new HU or amp. Last edited by jkoppee; 08-19-2010 at 11:33 AM. The Navi HU may have a center channel output after all. Information about the 20-pin socket (black, for the iPod and sat radio accessories) shows pin 1 listed as 'center audio gnd' and pin 11 as 'center out'. I don't know whether it's speaker-level or line-level. Looking at the rear of the HU, with the socket's thumb latch at the top, pin 1 is at the far right top, and pin 11 is below that. Remember that you'll probably need to turn on the menu option for the center channel. On the other hand, it's possible the output may always be active, and the menu option simply alters the way the audio gets mixed to all of the speakers. Subio, I just have a quick question about HID conversion. I've been looking around online for a good set, just wondering if you had to remove the bumper and headlight assembly to install? Just waiting on bloody paypal to transfer some money then purchasing the low beams off ebay. Was really hoping I didn't have to remove the bumper as I am not to keen on it haha. Only way that this is coming off is if I decide to repaint the grill. I did pull the bumper down. Probably not necessary, but it is easy to do with some bolts and fasteners. I will explore it when I have the time. Last edited by Cerreta; 09-21-2010 at 07:14 PM. Hey thinking of doing the gps mod and possibly the rear spoiler to my 2010 XSE. It's the same thing as the X however, for a limited time Subaru was offering the alloy rims and roof rails for only 400 extra. Reason I am writing is because I can not find the OEM GPS/radio unit for sale anywhere. Where did you order it from and how much. Also you said that one of the wires wouldn't fit on your 2009 and you had to get a mod? I assume you got the 2010 OEM GPS and you own a 2009 Forester X? Also the DVD's for the unit. Did you just order the Midwest one for 240 or you got the East, Midwest and Western DVD's too? In addition when taking off the panels and glove box how, where and with what did you start to take the panels off with? About the Rear spoiler though, weren't you afraid of water getting in and it rusting? What did you use to see around the bolts/ holes? I answered this in your PM. For others, look on ebay for a used unit. I paid about $650 for mine, but it took 6 months to find one. I totally love it!!! The GPS ispretty good to. I also have a Navigon, which rocks, but sometimes I can find things on teh car nav where it is not in Navigon. I actually use both units, but now prefer the car nav unit. The feature I wish the car Nav has is te posted speed limit for the road. Navigon has it. You must use a wiring adapter harness to convert the non-nav car to your new nav unit. The years have nothing to do with it. SVXdc can make one for you. He made mine with all the features I requested. Plus, he provides good support and lots of references. I was not concered about rust. You can use a metal prep to prevent this, or in my case, I used clear nail polish, but I live in Arizona, so rain is a novelty we read about in books. I was more concerened abou drilling holes into the car. I use apply pressure, the metal will bend. So, g slow and use a brand new bit that cuts well. A dull bit will require more pressure before the cutting action starts and this causes the bending. That part was scary I must admit. Okay, I checked this out tonight. Results: Center channel is live! So, I first checked the wiring with a voltmeter and I could not observe any significant changes when increasing volume. I tried connecting directly to a speaker and nothing. So, I thought maybe it was a line-level output. So, I clipped on a female RCA connector then hooked it up to the amplifier. Viola, crystal clear center channel sound. In order for it to work, you do have to turn on the center channel operation in the menu settings. I actually want to use the center channel for watching movies, not for radio or audio tracks, which sounds better in stereo mode. In fact, when turning on the center channel wihout a speaker connected to it, only surround sound signals are sent to the RF, RR, LF, an LR channels. Therefore, you lose the midrange frequencies and the voices are muted and vey difficutl to understand. Try it and you will know what i am talking about. This Navi HU uses a true 5.1 surround sound system, the same that you get in a home theater system. So, now I have the ability to run a true 5.1 surrond sound system in the car! However, this is a project that I intend to tackle in the future. I'm off to Africa for a vaction in a couple weeks, so that takes priority. For tonight, I spliced a 6 foot RCA cable to the proper wires so I do not have to do it in the future, in case I forget which wires do what. Also, this project will require a lot of effort to make it work. I need to purchase speakers, find best locaton to mount them (I'm leaning to the small cargo space directly in front of the transission shifter), and I will likely have to buy a new amp. I have the JL XD600/6 but 4 channels are in use with the remaining two channels bridged for the sub. I feel the subwoofer is under powered, so I will likely buy the JL XD 600/1 for the sub and connect the center channel to the two remaining channels on the 600/6. If I run two speakers, like a mid/tweeter or mid/mid then I can split that center signal and run both speakers on a 4 ohm load. If I get just one speaker then I will run it in bridged mode. Okay, so back to the wiring. David (SVXdc) you are correct. Pin 1 (Purple, Center Channel negative) and 11 (Green, Center channel positive) on the black Ipod 20 pin connetor is the proper signal source for the center channel. It is a low voltage line-level output, so you must connect it to an amplifer. The center channel must be turned on in the Navi menu in order for it to function. I think it will work on movies as well as other input sources like the radio, sattelite, etc. but I did nt check those. I did not splice into the harness that connects to the HU. The Ipod kit has another female harness. I spliced the RCA cable into this locaton. This way it is much easier to hide that cable and it remains out of the way. My recommendation to you is to produce a wiring harness for center channel with that black male plug and a female RCA connected to the 1&11 pins. This way, if someone is using the Ipod kit, then they just snap this harness plug into the open Ipod female plug. If they do not use the Ipod kit then they can snap the harness plug directly into the back of the Navi HU. Here are a couple photos on the plug and wires. On another note, I can also watch movies from an Ipod touch on the Navi HU screena and the car seakers. I use an Ipod composite cable. I ran a video cable from the back of the Navi HU to the center console. I inserted a female RCA connector next to the 2.5mm stero jack. So now, I connect Ipod yellow cable to video jack, then I use a simple 2.5mm stereo to RCA adapter. The power usb cable from the ipod cable is connected right into the aux 12volt socket. When connected, the Navi HU will display a video source in the menu options. 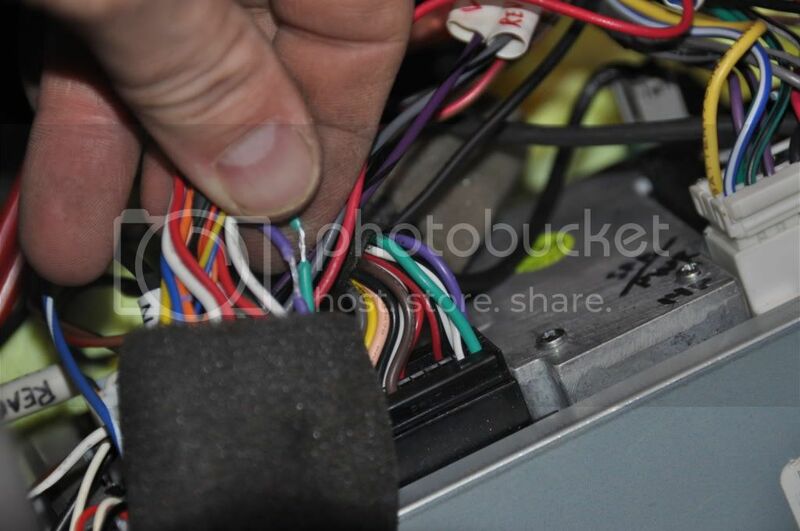 For those people with the three RCAs in your center console instead of the 2.5mm aux port, you just connect the Ipod composite cable right to those jacks and you are done. No adapters are required. I have the 3 RCAs (white, red, yellow) in the center console of my FXT and I tried the video from my iPhone and it didn't work. Actually, the video displayed on the screen for about 10 seconds (with audio), then I get a message on my iPod saying that the cable is not compatible or something like that and the video goes away. While we're on the subject, do you know how to ground the Navigation HU so that all functions are available even when the car is in motion? Yes, it is posted somewhere in this thread. Good luck finding it. You also have the stock Navi, so my adapter wire color may be differentthen the one you want. Just search for it in this thread. 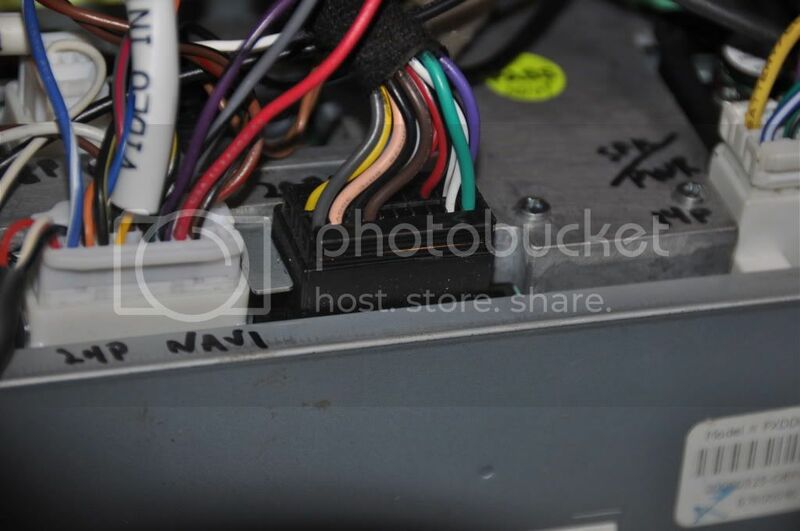 SVXdc has some photos and wire schematics to locate that wire. All you have to do is cut it and ground it. It is the wire that connects to BRAKE. Easy job. As for the ipod connection, that is strange. Are you using an OEM Ipod cabe, or some other brand? I would try it again with a video movie. It will not work with streaming movies, I tried that. It pisses me off that I can't play steamed movies on a bigger screen. OK, here's a much less expensive mod I think you'll like: Make an RCA plug with its two terminals shorted together. Plug that into the 'reverse phase' subwoofer output jack (on my cable on the 24-pin Navi harness). That will make the signal going out the 'positive' output louder. I know you ran long RCA cables from both outputs down to your amp and could do it there, but it would be better to do this right behind the HU. A new member from France!